The house was great and very comfortable! Great Condition and would stay there again! This beautifully-renovated Lighthouse Avenue home is only a few blocks from the Monterey Bay Aquarium, Cannery Row, fantastic restaurants, and sandy beaches. Spend the day kayaking with the otters or riding a bike along scenic trails. Feel like shopping? Carmel is a short drive away, with fantastic boutiques and amazing restaurants. Like golf? Pebble Beach and the equally famous 17-Mile Drive are minutes away. If you’re in the mood for a day trip, the Santa Cruz Boardwalk - with fun activities for kids and adults - is less than an hour up the coast. Or take a drive along scenic Highway One to the south, and marvel at the natural beauty of Big Sur. When you're ready to unwind after a day of exploring, sip a cup of tea and enjoy the bay views from the front porch, or lounge on the upstairs deck with a glass of one of Monterey County’s award-winning vintages. 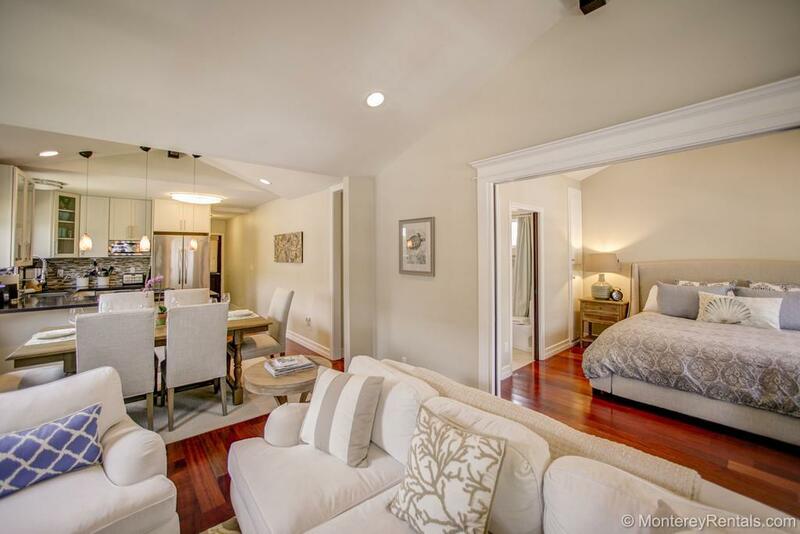 The three bedrooms and two and one-half baths are all furnished with comfort and exquisite attention to detail. Two bedrooms and two baths are on the ground floor; one bedroom with a half bath is on the upper level. Street parking only for two vehicles. What a beautiful home. Everything you need in a great location. Very clean and comfortable. This is our family's second time at this property and we enjoyed ourselves even more! The home is well-appointed with nice finishes and furniture, the location is terrific, and this time we enjoyed the amenities even more (outside deck, fireplace, games, etc).It was the perfect spot for our family weekend and we will surely return again! The Cannery Row Cottage was the perfect size and location for our family vacation. It had the perfect amount of space for 3 couples and was conveniently located for activities and meals. We enjoyed the well appointed kitchen for making meals together and the large dinning room table for family game times. The decor was lovely and the photos online tell the story of the beautiful home. The gloomy/cool weather was the only downside to this first of what I hope is many family California vacations. The house was perfect. We brought our two children to where we met and had out first date many years ago. The house was perfect, we all had our own space, we enjoying the living space with a fire each night and the porch and outdoor space was a bonus! Being two blocks from the aquarium was amazing. It was a short drive to Big Sur, Carmel and the wharf. Would definitely recommend! This house was an incredible start to our perfect California vacation. We are a family of 5 (2 teenage girls and a college age son) We travel a lot and having their own space is a must. The Cannery Row Cottage gave them their space and ours! Great bedrooms and bathrooms. The upstairs bedroom with outdoor terrace was amazing! The kitchen is beautiful--we enjoyed cooking meals instead of eating out every time. The washer/dryer were put to good use, and the living room is a spacious place to gather for some family time. Overall, it was a positive experience and a perfect house. I highly recommend this cottage. This is just like a house we'd love to retire to one day! It is so beautiful! Wow!! Nice!! Those are just a couple of words we all said as we arrived at and entered Cannery Row Cottage. We were able to park our two cars in front--ample space and parking permits were provided. The front yard was clean and very well-maintained, and as I climbed the stairs, my thought was of being able to sit on the front porch bench. The cottage was very comfortable and clean. We all liked the furnishings and the kitchen was well-appointed and supplied. The bedrooms were very spacious--we appreciated that each had a bathroom. The beds were sure COMFY--not one of us had sleeping problems. We had easy walks to the Aquarium and Cannery Row. Incidentally, we brought a stroller for our two-year old, but what a nice surprise to find that there was a stroller at the cottage. My son spent his time playing golf at the Pebble courses, so he didn't have far to travel. The only downside was the rain, but that didn't keep us from getting out, but I didn't get to use the bench. Maybe next time--I'm going to make a point!! The only suggestion any of us could make was that we could have used some washcloths. We thought that maybe it was just one bathroom, but there were not any--I guess we're just kind of old fashioned that way. We had a great trip and it's a fabulous property!! Thanks for everything!! The Cottage was perfect. We loved being walking distance to Cannery Row and the walk/bike path to Pacific Grove. The house was very clean and well equipped with everything we needed. The 3 bedrooms and beds were great and even though one only had a half bath, the area was well lighted and convenient to dress and get ready to go out. The two showers worked out fine for the 6 of us. Basically, we all loved it and will likely return in the future. We stayed st the cottage with our son ,his wife and two young daughters.The location is very convenient ,situated 3 minutes away from a large supermarket,and about 10 minutes from the waterfront .The property itself met our expectations ,except maybe the glass ware.A new set of wine glasses,including some flutes to enjoy the Californian sparkling wine would be welcome. We've restocked the house with wine glasses so you can enjoy some California bubbly on your next trip! My daughter, 2 young granddaughters and I like to take a girls trip every year. We had been to Monterey before but stayed in a different cottage. We will definitely be back to this one in Cannery Row. Everything was immaculate. We could walk to everything including the beach. Thoroughly enjoyed our stay. This is the second time we have stayed here. We were also here last year. Our experience this year was just as nice as last year. Maybe even better, because there was no fire this year. Our only problem was the telephone line from the phone to the wall was missing, but was replaced. We noticed some cracking in the plaster above the dining room table. Thank you so much for alerting us to the cracking in the plaster ceiling - it has since been repaired. Pictures are accurate. Nice cute little house w nice features. Great bathrooms. Very convenient location, walk to grocery, walk to aquarium. Easy on street parking in front of house w provided permit. Area seems safe and clean. Master bedroom w sliding French doors. One sliding door is blocked off, no privacy in this room, the door should be released for use as needed. Bowl sink in this bathroom is cool- the drain plug is difficult to use and needs to be serviced. I would highly recommend this house for visiting Monterey. Thank you for your review, and for letting us know that the bathroom sink needed service. The master bedroom has sliding pocket doors which close for privacy - we’re sorry you had a problem with them. We have a 24/7 maintenance line to help guests with anything that is malfunctioning or that they do not know how to operate…. we wish you would have called while you were here so that we could have assisted. We stayed at Cannery Cottage over 3 days for my mother-in-laws birthday celebration with the grandchildren. I loved that the cottage was 3 blocks from the aquarium and waterfront area, perfect for morning strolls, taking little one's the the aquarium and visiting restaraunts on Cannery Row. The boys were able to play in the small yard and scooter around the neighborhood easily, The place was very clean, well-appointed decor and had wifi and cable as well as a BluRay for movies at night, The perfect place for a small family gathering, families with small children or friends weekend in Monterey. Not suitable for a large group who is looking to party all night long as its in a quiet neighborhood. Beautiful stay at a well-appointed, comfortable, beautifully decorated home. Ideal place for 3 couples to stay. Very comfortable beds. Could not have been happier. This cottage is as cute as it looks in the photos! Probably even better! This was my first experience staying in a residence rather than a hotel. I can see how this would be so FUN with family or friends along. Since it was just the two of us, we didn't cook but the kitchen was wonderfully equipped to make a gourmet meal. The front porch sitting and back garden sitting area are great gathering spots for quiet conversations. Cannery Row was a short walk and we enjoyed the aquarium and shopping and wine tasting. I would probably stay here again if I take friends or family. Great location: 3 blocks from the Aquarium. Within walking distance to Nob Hill Foods and a 7-11 store. Close to many good restaurants.Negatives: the telephone did not work, but was fixed by maintenance (the phone jack was plugged into the wrong spot on the modem). The stairs to the upstairs bedroom are dangerous. The steps are too narrow so you can slip off the stairs. The hand rails should be on the other wall.The rectangular dining room table is too big for the room (a round or oval table would work better)It took a long time to boil water on the stove.Positives: The great location and everything else about the cottage was as described and very nice and well maintained. We would definitely stay at the Cottage again. We loved our rental. A spacious house with plenty of extras. The kitchen was equipped with everything that we needed. An easy walk for most to and fom Cannery Row and the aquarium. We slept great on their beds. Just be careful going up the stairs to the otherwise awesome upper bedroom with a nice deck. Enjoyed ourselves so much we just contacted Kyle for another upcoming rental. Wonderful stay at the Cannery Row Cottage! The Property Manager, Kyle, had everything in order when we arrived... The minute we walked through the front door, it gave us a welcoming feeling right away. The open concept cozy living room with gas fireplace allowed you to see right through to the dinning area and then into the modern kitchen (everything you needed, dinnerware, utensils, etc.) and stainless steel appliances. We also enjoyed the use of the laundry room during our six day stay, the bedrooms were comfortable and fully stocked with enough towels and all the items needed to keep house as needed, would have loved to stay longer... very comfortable.We found the cottage to be in a very convenient location, we were walking distance to restaurants, grocery store, walk/running/bike paths and especially the numerous activities of the Monterey Acquarium and Cannery Row.Thoroughly enjoyed our stay. A+ experience! This review is just as much about Monterey Rentals as it is the cottage. MR is easy to do business with particularly on line. Thank you for the service! My wife and I brought out three kids (18 months - 6 yrs of age) to Monterey for the weekend. The location was perfect and walking distance to the aquarium. The cottage is an updated 2 bedroom with a lift serving as the 3rd bedroom. Given our children's ages, the stairs to the loft are tricky and we were able to keep them from the stairs. The full kitchen was great and the kids enjoyed the small yard. Only small downside was a small ant problem in the kitchen. Aside from that, the place was great and we'll be back. Wonderful place. Decor was beautiful. Nice view of the Monterey bay. Walking distance to Cannery Row. Good work out walking back,up hill. It was a wonderful stay for my 60th birthday celebration with friends and family. Recommend dinner at Chart House, Sardine Factory, Fish One. If you like a beautiful home with exquisite and top-of-the-line details/touches, and in easy walking distance to the Aquarium and Cannery Row, look no further than this wonderful rental. We loved everything about this home, especially the gorgeous kitchen and bathrooms. Hope to return again. Three couples shared this cozy cottage and got along very well. The bedrooms and bathrooms are well appointed. The kitchen had everything we needed. Outdoor space was "just enough" for those pleasant mornings and evenings. Great location - easy walking to Cannery Row. Staying in the Cannery Row Cottage gave us the real experience of living in the Monterey area. We were so centrally located that walking to the local attractions was very easy. All of the golf courses were just minutes away. Dealing with the rental group was extremely easy. I would highly recommend staying at the Cannery Row Cottage. Beautiful home and walking distance to the Aquarium! A wonderful home, super clean and only a few blocks from the aquarium. The home has been recently remodeled, lots of new, clean appliances. We had plenty of room for our party of six (three couples). Nice deck (limited bay view) outside the upstairs bedroom. We will defintely be coming back! A little street noise in the AM from the local bus, but nothing we could not live with for a weekend. This house is beautifully renovated with new bathroom features, upgraded appliances, and lush decoration throughout. The location is perfect, as a 5-10 minute walk will take you to Cannery Row, the Monterey Bay Aquarium or to walk along Ocean View Blvd. Three comfortable bedrooms and two full baths made our stay very easy to manage between four co-workers. If we head back to this area next year, we will be looking to see if this house is available for us again! Perfect Location, Modern & Clean, Clean, Clean!!! This cottage was perfect. The owners have really thought of everything (even included a residential street parking permit!). They also have filled the place with very modern and comfortable decor. The entire place was sparkling clean too. I would definitely stay here again. Updated, clean and good location. Very nice, clean and updated house. Convenient location to pacific grove and cannery row. Beds are comfortable and high quality bedding, bathrooms are nice and clean, but need window covering in bathroom attached to bedroom 2, especially with a glass shower enclosure, and no privacy while getting dressed with neighbors fence right there. Kitchen table has all place settings on table, which I feel is unnesessry and somewhat in the way. Gardeners showed up at 7 am on a Tuesday and woke us all up, other than those 3 minor things it was great. I would stay here again if we return to the area. Cannery Row Cottage was perfect! The rental cottage is close to everything on the Monterey peninsula as well as within walking distance to the Aquarium, Cannery Row shops and restaurants, and downtown Pacific Grove. The unit was immaculate with all the features we needed for a week stay during Monterey Car Week. The three separate bedrooms are perfect for a family or two couples. We ended up cooking several meals in and had everything we needed in the kitchen including a grill on the back patio. Parking is right at the front door and the neighborhood is very safe. The only drawback is the busy street, but we didn't mind this. Great location, beautiful home, very comfortable. I think a hand rail at the top of the stairs would be a great idea a little scary to come down the stairs you really have to focus. This was the perfect spot to stay!! Walking distance to the Aquarium, restaurants, beach walk!! The house was perfectly set up, ever detail covered!! Very cozy!! Would Definitely stay again and recommend to friends and family! !My two girls ( 8 & 10) travel and I, travel with our Auntie! We have done many VRBO rentals, this one was as I said Perfect!! We truly enjoyed our stay at this beautiful house just a short distance from Cannery Row and the Monterey Bay Aquarium. The property was clean, modern, and comfortable. I can't recommend the location or the property highly enough. We'll stay there again. Well-appointed home served as an excellent starting point for our time in Monterrey area. The three bedrooms were perfect for us and our adult daughter and son. A supermarket and convenience store are also nearby. Many restaurant choices (Sardine Factory, Bistro Moulin, and more) are easily walkable from the house. For our visit, the coastal fog moved off-shore early and we enjoyed plenty of sunshine. We stayed here with a group. We came to run in the Big Sur Marathon and wanted to be able to cook our own meals. Very lovely home. Delightful stay, beautiful cottage, clost to the aquarium! I'm from the bay area and took my two middle school children to Monterey for Spring Break to check out the aquarium for a couple of days. This was a perfect spot to do that! It is within in walking distance to the main strip, yet far enough to be away from the crowds. The cottage is cute, well-decorated and extremely comfortable. We all had enough breathing room to recover at the end of a long day. Everything is very tasteful, is of high quality,, and has all the amenities you want in a high-end rental, including high speed Internet access, movie channels, beautiful kitchen. In addition, the service is top notch. One of the smoke alarm batteries went out when we got there so it started chirping, and the maintenance person was there withing 10 minutes to fix it. He was extremely friendly and helpful, and made sure we had everything we needed for our stay. We also left a computer charger behind and they went out of their way to send it to us as soon as possible. I highly recommend this rental -- we'll stay here again! We were staying in Monterey for an event. The Cottage was very convenient and super comfortable. All the amenities were great. We highly recommend this rental. Cozy, Modern Cottage in a Great Location! We stayed at the Cannery Row Cottage for the New Years holiday - and even celebrated our engagement there! The space was "cozy" (small) and over-furnished for six adults and two children, but given the great location (three blocks from the aquarium and Cannery Row), all eight of us weren't together at the house much beyond meals and late evenings (when the kids were asleep). The house was in perfect conition when we checked in (kudos to the housekeeping staff), and the kitchen was beautiful, well-stocked and a pleasure to cook in. Often there were two or three of us cooking at once and the open floor plan made it easy to visit. We really appreciated little details being taken care of like the parking permits, extra set of keys, and stereo system. A group of us rented a house for a similar vacation last year, and everyone agreed that this property was a great improvement in nearly every way. The only two things that could have been improved were: first, the bed in the upstairs room. Though I didn't sleep in it, I'm told that the bed upstairs was not comfortable. Second, the garbage cans outside were full when we arrived (probably because of the holiday trash collection schedule) which meant that, by the time we left, we were having to pile our trash and recycling next to the bins. I think all of us would recommend this property to friends. We had a really comfortable stay! What an absolutely adorable cottage! Very charming with all amenities at hand. The cottage is within walking distance to the ocean, Monterey aquarioum, restaurants and more. We truly loved spending time in Monterey and then walking back to the cottage, so convenient! It is a very nice place. Very central to everything. You can walk everywhere. The stairway to the upstairs bedroom is a little scary. It needs more handles badly. Thank you for your comments, and we’re happy you enjoyed your stay at Cannery Row Cottage. Yours is the first compliant we’ve received about the stairs, but we will definitely pass your request for additional handrails to the owner. We apologize for any difficulty you encountered in trying to reach us (when we responded to your message, it went to your voicemail). We do have a 24 hour maintenance line (the number listed in the home and in your key packet) to help ensure that any issues are resolved asap – our mission is to make sure you have a perfect vacation. We look forward to your return! The cottage met and exceeded or expectations. The accommodation had everything we needed, as if we were at our own home. My daughter and son enjoyed the short walk to Cannery Row, and the beach. The view of the bay from our front door was great. The only negative was the sleep number bed that my son could not get to work... He said the bed was too hard. My daughter wanted to live in the cottage forever. I am sure that we would consider renting the house again in our next visit. Thank you for providing such quality lodgings. Spent 4 nights at the cannery row cottage. The house fit 6 people comfortably. The house is well appointed with everything you could need for a weekend getaway with friends or family.